WTI crude prices have climbed above $53.50/b this morning. WTI opened at $53.40/b today, an increase of $0.27 above yesterday’s opening, and the highest opening price since March 2nd. 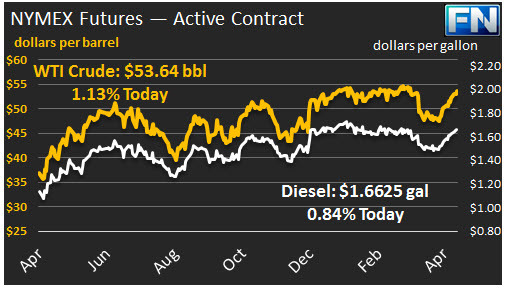 Current prices are $53.64/b, $0.24 above yesterday’s close. Product prices also posted gains yesterday and continued to rise overnight. Diesel opened at $1.6545/gallon in today’s session. This was an increase of 0.37 cents (0.22%) above yesterday’s opening price. Current prices are $1.6625/gallon, up 1.19 cents from yesterday’s close. Gasoline opened at $1.7639/gallon today, an increase of 0.22 cents, or 0.12%, from yesterday’s opening. Prices are $1.7636/gallon currently, up 0.59 cents from yesterday’s close. Crude and product prices have risen now for four consecutive trading sessions, and prices strengthened further when early reports came out that Saudi Arabia had reduced its crude production again in March. This morning, OPEC released its Monthly Oil Market Report (MOMR.) Saudi Arabia reported to the OPEC Secretariat that it had cut production from 10,011 kbpd in February to 9,900 kbpd in March, a drop of 111 kbpd. These figures had been released prior to the MOMR report being made available to the public this morning. However, the OPEC MOMR notes that secondary sources place Saudi production at 9,952 kbpd in February and 9,994 kbpd in March—an increase of 41.6 kbpd. There is almost always variation between the numbers reported directly to the OPEC Secretariat and those developed according to secondary sources, but the change in direction is likely to cause some debate. Nonetheless, Saudi Arabia already has cut production below what it had pledged to do as part of the OPEC-NOPEC deal. Saudi Arabia also reiterated its support for an extension of the cuts through the remainder of 2017. Also supporting prices today is an expected decline in crude and product inventories. The Schneider Electric survey on Monday pointed to a crude drawdown of 1.0 mmbbls, a gasoline draw of 2.0 mmbbls, and a distillate draw of 1.5 mmbbls. 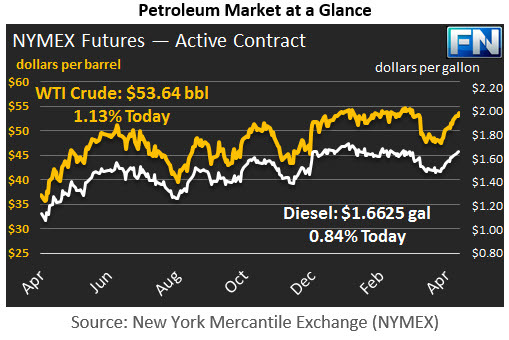 Sources reported Tuesday that the API data series showed an even larger draw: 1.3 mmbbls of crude, 3.73 mmbbls gasoline, and 1.58 mmbbls of distillate. Both diesel and gasoline inventories have been drawn down in eight of the past nine weeks. The reverse has been the case for crude inventories, which have grown in eight of the past nine weeks. The market is awaiting the official data from the EIA later today in hopes that it corroborates the industry data.